Ships Monday, April 22 if ordered in the next 2 days, 7 hours and 26 minutes! 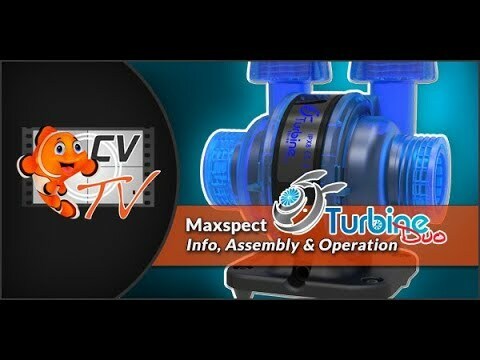 The Maxspect Turbine Duo is the first EXPANDABLE water pump available for both freshwater and marine hobbysts. It is capable of pushing 1,300 GPH using a single output or, best of all, add a second intake and output to the same pump and increase your flow to 2,500 GPH! That is a total of 1,250 GPH per output. Even better, combine the two outputs into a single output (adapter included) and get 2,250 GPH from a single output! The Turbine Duo features three (3) separate configurations. I can replace two "regular" pumps. Break down the pump to a ultra compact powerhouse using far less space within your sump. The Turbine Duo offers high performance while consuming less energy than the competition. It is incredibly quiet! Each Turbine Duo comes with a complete set of adapters and accessories for simple to install to almost any system right out of the box. The first water pump that is configurable to the typical single input/output pump configuration as well as a dual input/output for additional flow reaching 2500gph! can this be used IN SUMP ? Yes, this can be installed in sump.